Some of you have running in the back of your mind a sort of bucket list. These are the things we’ve always wanted to do but for one reason or another they are always put on the back burner. I have been trying to do this Coe back country weekend for some time now because supposedly the lakes on the East side that are real hard to get to have lots of eager hungry bass in them. 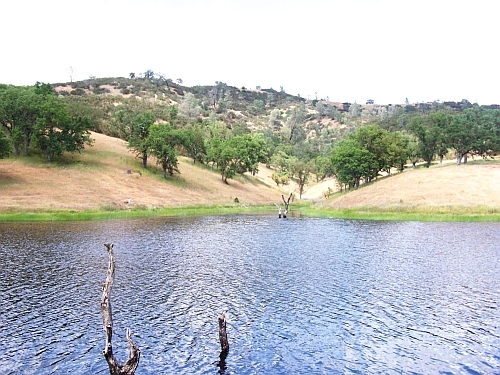 Back country weekend happens once a year at Henry Coe Park. You are allowed for a fee to drive back about 10 miles into the back country and start your hike from there. It is a 3 day event but I was only able to go one day. So I took advantage of the back country weekend and ended up going to Jackrabbit Lake which is way back there and would normally take you several days to do a round trip. I’ve always said to myself this place has got to be good! It’s like that magic fishing hole nobody is supposed to know about but when you get there you find out that everyone thinks about getting to this place too someday. I left later in the morning again a low pressure day. This time I left everyone behind and did a loner trip. This usually means that I travel light and keep a blistering pace on my hike. This was true as I averaged a little over 3.5 miles per hour. I got to Jack Rabbit Lake after several elevation gains and losses. They don’t tell you that when the country is rolling hills those advertised elevation gains are done sometimes several times. So when they say 900 feet elevation gain it turns out to be times 3 or 4. I arrived after hiking ~7 miles and sat down for lunch. The lake was an unspoiled beauty but had many aquatic plants. This meant you had to use weed less lures or at the very least semi-weed less. There were not too many trees surrounding the lake so the casting was good. Since it was back country weekend there were quite a few people there. 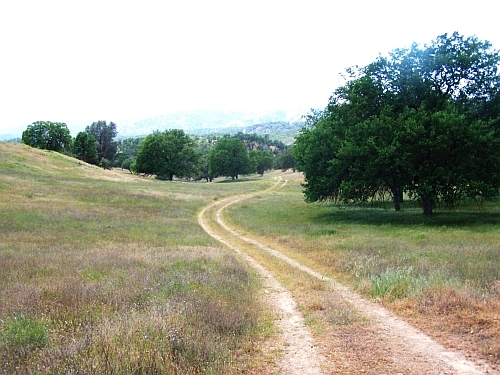 In Henry Coe Park you can also take your horse or your mountain bike, which are all faster than hiking. This is the time of year when temperatures are cool so you can take advantage of keeping a brisk pace without getting dehydrated too fast. You can also car camp or back pack on this weekend I saw quite a few people doing this. One other thing was that the Boy Scouts were out in big numbers. I tried an imitation bluegill fly that I tied but it needs further development so I decided to go with my Clouser minnow. I let it sink and jiggled it in. STRIKE! Got a hit and caught a bass. This lake has quite a few small mouth bass and no bluegill. I did see a few frogs jump into the water as I walked along the bank. 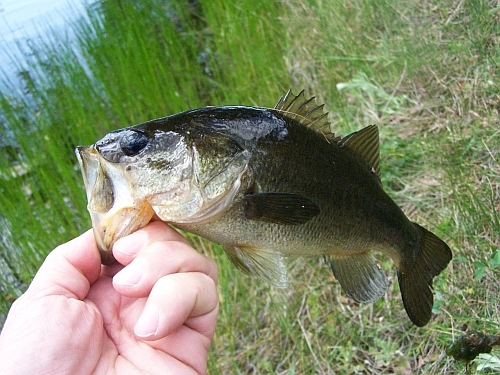 So probably the main foods for these bass are tadpoles, minnows and frogs. I talked to one Scout Master that was fishing and he said that in the evening you can score big on top water lures that imitate frogs. I caught a few bass and it was time to hike back the seven or so miles to the shuttle. It was a nice day and I can now scratch this one off my list. Next year I will try and do a 3 day back pack trip on back country weekend and hit a few lakes. Any takers? t was a beautiful spring day out in the hills past Anderson Lake. 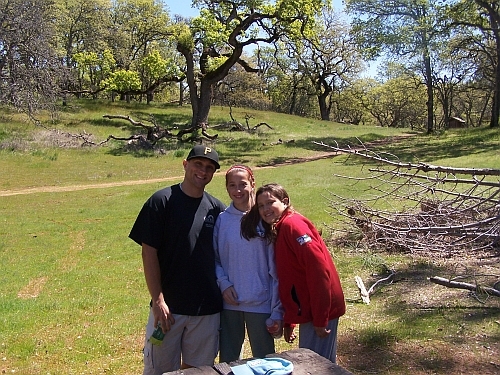 I took my three kids out for a nice day hike and picnic. I kept telling them this was a low pressure low stress day. The kind of day the birds are singing, the turkeys are gobbling and the fish are jumping. We headed off to Henry Coe Park. There are many ponds and lakes in this park. Some are fairly close but some can take you days to hike to. Since this was an easy day we went to a pond close to the entrance. The hike was quite pleasant as the weather was cool but not cold, the sun was out, the breeze mild and the hike over the rolling hills seemed to take on it’s own pace. Pretty soon we had passed the pond and were headed for the picnic tables to have lunch. Like I said earlier this was a low stress day so we had left around 10 am from San Francisco or there about. 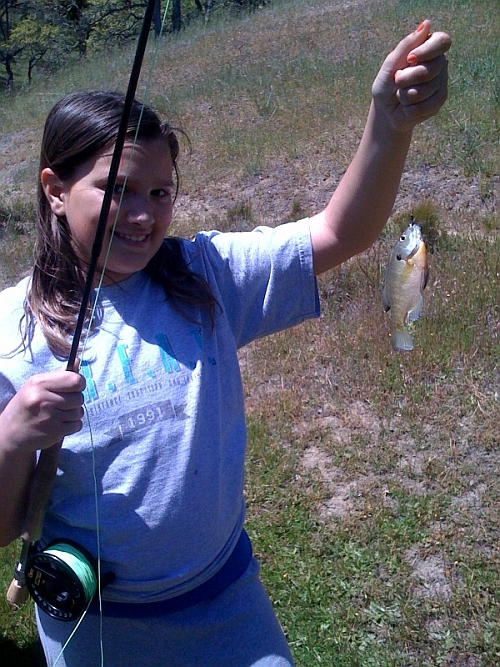 After lunch we strolled over to the pond to try our skill at catching some bluegill and largemouth bass. On the way we heard some turkeys gobbling so we decided to use a custom pot call made by Joe LoSchiavo to try and call in some gobblers. They answered back real nice and I was able to show my kids how to call to them using this call. I explained that this is the hen’s call and all that stuff. They really enjoyed the opportunity of having their calls answered. All my kids decided that the thing to do was to try and find these turkeys out. 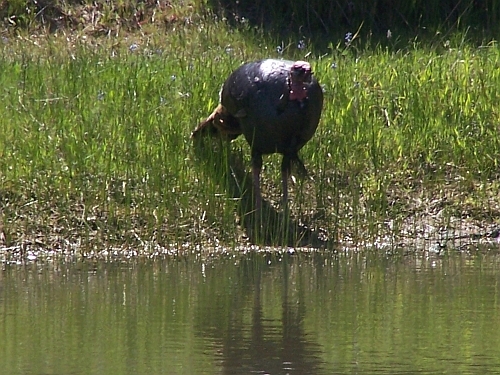 They were able to stalk close enough to get a look at the turkey they heard gobbling from the road when we were close to the pond and watch him respond to their calling. Later one even came down to the water to visit us while we were fishing. I decided I had called enough and wanted to get to the business of fly fishing. I spotted some blue gill and set everyone up to catch them on small flies. I tried my searching pattern which is usually a Clouser minnow. I caught a bluegill with the minnow but the fly is too big and the bluegill could hardly get their mouths around this fly. I changed to a #18 black ant which is tiny but great for small bluegill. As I was catching and releasing these bluegills and having a blast playing the little critters a huge largemouth bass came out of the depths and took my bluegill from me! I was a little irritated to say the least. Those little flies are hard to tie and that poor bluegill was gone. I though for a minute, "What should I do?" My line was disappearing my kids were jumping all over scared that this monster was going to get them next! As my line was going out all I could think was, STRIKE, STRIKE, so I did and man I thought I had a tire on or one hell of a snag! As I played the fish I discovered that it was hooked in the lip with a #18 ant. I was very careful playing him because I didn’t want to loose him. I did not know if he would straighten the hook out since it was so small. I was also afraid that the line would break. I did not have a net with me so I ever so gently beached him. The tension did not leave me until I had him in my grip! I did not have a scale or tape measure but I want to say the bass was close to ten lbs. I did measure it against my fly rod and it is approximately 21 inches long. 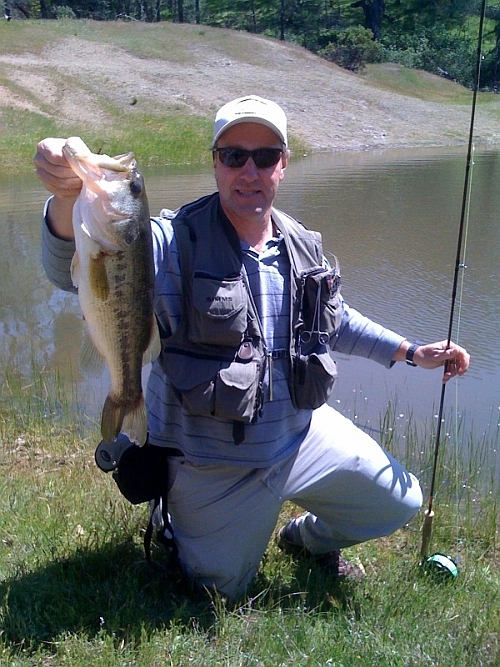 This is the largest largemouth bass I have ever caught and I have been trying for quite a few years. Always dreaming of catching a big one but I went home many times empty handed. The best part of the whole day was that all my kids were there to watch me. Hopefully they will pass on the story of dad catching a big bass to their kids.